Give Me 7 Minutes And I Will Teach You To Play Sweep Picking Arpeggios - FREE! Play sweep picking arpeggios at very high speeds consistently and effortlessly. Enter your name and email to get access to the video. Learning how to play sweep picking arpeggios at very high speeds with flawless accuracy is difficult for most guitar players. Why? Because most guitarists make small but critical errors in their picking hands. This is especially true when an arpeggio contains either a change of direction, a hammer on or a pull off. To master sweep picking and arpeggios, it is critical that you understand the insider secrets to how the greatest guitarists play these techniques. By understanding these secrets you will be able to easily play killer sweep picking arpeggios. 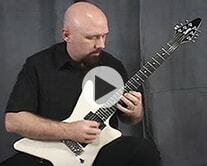 Get free access to the "How To Play Sweep Picking Arpeggios" video now. Simply enter your name and email, then click the "Show Me The Video" button to enter. All of your information is always kept 100% private and confidential.